One of my beloved's favorite sandwiches is a Patty Melt. He often ordered it in restaurants while we dated and when we grill burgers it is a great way to use up extra meat patties. 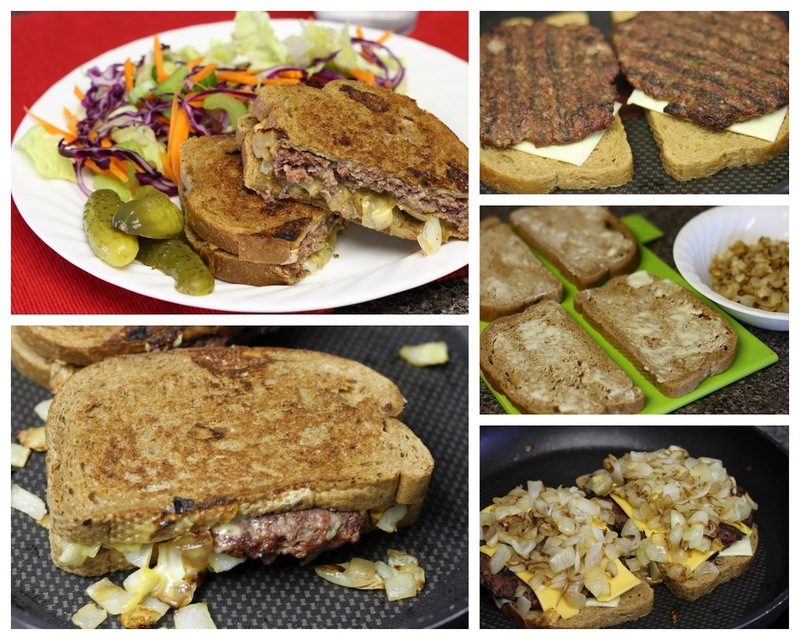 It is a great way to use up the leftover grilled burgers from a party. Whether you fry them just before putting together your sandwiches or use left over grilled burgers from the night before....they'll be a favorite at your house too. Wrap cold leftover beef patties in foil and warm in 350 F oven for 15 minutes to take off the chill. Dice the onion and fry it in 1 tablespoon butter over medium heat until caramelized and set aside. Butter one side of each slice of bread and place two pieces buttered side down in still warm fry pan. Top with 1 slice cheddar cheese, then place beef patty over cheese, top with onions, sprinkle with salt and pepper and top with the slice of swiss cheese and then finally the other slice of bread (buttered side up). Turn heat to medium low and leave on the first side until bread is golden brown and the cheese is starting to melt. Flip sandwich over and continue to fry until the second side is brown and the cheese has melted. Serve with thousand island dressing and dill pickles. You brought back a memory of dating years! The patty melt is one mine would often order as well and I'd forgotten all about it. We'll have to grill extra burgers next time for sure. oh, this is such a manly type of meal! a zillion calories, and none of them would stick! Patty melts are always so delicious and yours look especially so! Another way to reheat cooked hamburger patties (or any meat) is to use a steamer basket in a saucepan. Keeps the meat very moist. Now I'm craving a patty melt! Mary, thank you for that advice on how to reheat hamburger patties. I remember my Mom doing that when she made round meatballs.